Santa brought us new phones! Samsung Galaxy Nexus replaces our 3+ year old phones! Our new hats from Judy and Leroy…notice who took the Captain’s hat! The TIKI HUT with a Great Blue Heron on the peak….how cool is that!? 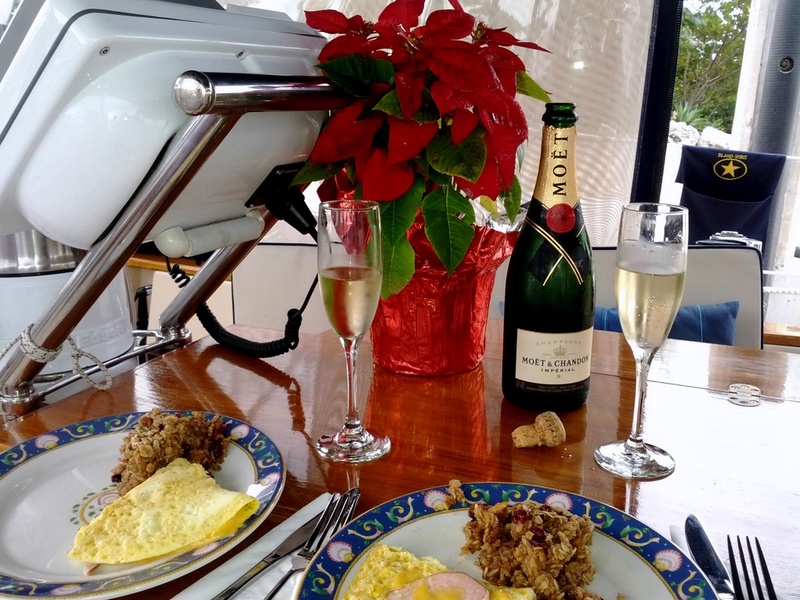 Weather: 80 degrees, sunny, 10 knot easterly breeze…..Merry Christmas from Marathon, FL! This afternoon we will use the clubhouse kitchen and cook up our Christmas Dinner with Catspaw and Finistere and enjoy the lanai and the palm trees….. a holiday to remember! We have here been here a week already and we find it is sure EASY to live at HCC, Harbour Cay Club, a private marina facility. Life at the dock is wonderful, with endless power, water, laundry, and a beautiful club house. We have been riding our bikes all over town and enjoying the traditional Tiki Hut nightly sunset gatherings at 1700 hrs. The weather is fantastic, as it is not hot and it is not cold and there are no bugs. We don’t need our air conditioning, but we do need sun screen and shade. It has not rained except for small sprinkles which last about 10 minutes and then we enjoy beautiful rainbows afterwards. Yes, life at HCC in Marathon, Florida, is paradise and very peaceful and relaxing. It will be difficult to press on out of here after our month ends, but that is our plan. It’s been 3 years with a Blackberry Curve! Christmas arrived here with packages from Radeen’s family in Seattle and Phoenix. We finally upgraded our 3+ year old cell phones to the new Samsung Google Nexus with Android 4.0.2 Ice Cream Sandwich OS. We both now have the same phones which makes it easier to learn. It feels like Christmas when the festive packages and delicious treats arrive. Thanks everyone! Here are some photos for the week….Merry Christmas Everyone! We really enjoy our pet iguana.. We named him IGGY cause my brother had one named that. Yes…life at HCC, Harbour Cay Club, is really peaceful, relaxing, quiet and friendly. This 24 slip club is a great place to spend a winter. Forecast for today, 80 degrees and sunny. Rest of the week is like this: 80 during the day, 70 at night, sunny, slight change of showers…. ahhh, a tropical Christmas! On our way to Marathon, Florida, we had dolphins swim with Team Island Spirit. They swam right next to the cockpit and jumped and rolled over on their sides as they looked up at us. It was a very special moment and one of our first dolphin encounters. They are so beautiful to watch as they swim. I am guessing these dolphins were about 6 to 7 feet long. Please watch this 2 minute video and smile along with us…. We have arrived at our destination! Our good friend Captain Jim’s Harbor Cay Club is a private 24 slip community that is beautifully landscaped and immaculately maintained. We were assisted by our fellow Island Packet Fleet members, Ron & Mary Ann on IP380 CAVU and Ed & Patricia on IP37 FINESTERE, along with the local dockmaster Gary and Jack, who are owners here. Once we were securely docked, we helped dock our buddy boat, SP Cruiser CATSPAW, who immediately prepared some V8 Fusion “healthy” drinks with some rum to toast our arrival. Mary Ann gave us the royal tour of Harbour Cay Club, showing us the clubhouse, lanai, laundry room, bathhouse, ice machines, recycle center, tiki hut and shuffle board court. The property is beautiful and it is obvious the owners are very proud of it. I will post a full photo essay of Harbour Cay Club next. We are so happy to reach our destination and to have a break from moving the boat day after day. It will be great to launch our bikes and ride to the Seven Mile Bridge and around town. 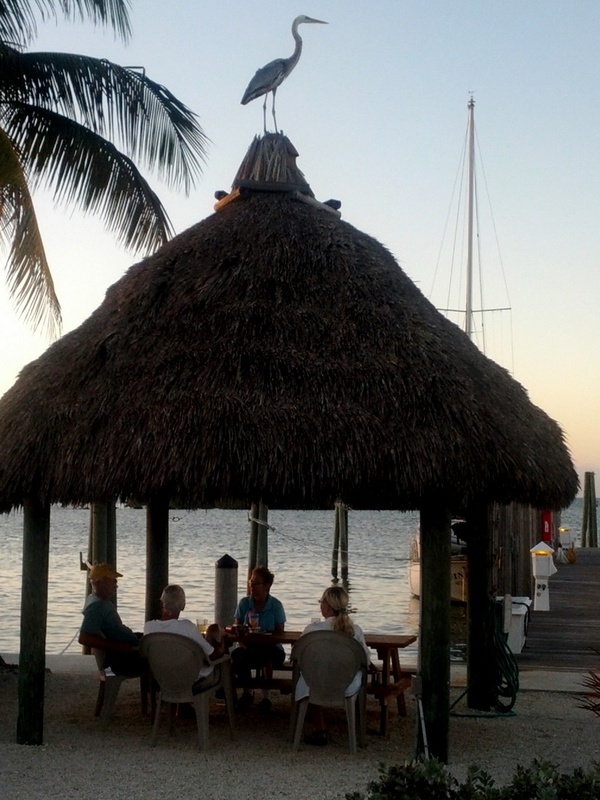 We will enjoy going for walks and watching sunsets from the tiki hut with good friends and the local members. 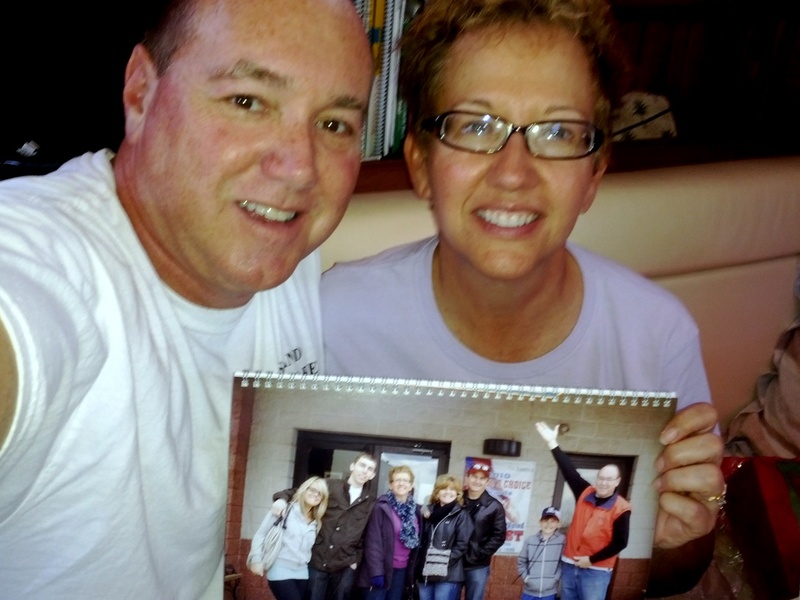 Our happiness upon arriving was diminished by the absence of our gracious host and good friend, Captain Jim. He suffered a heart attack two days before our arrival and is doing well following surgery in Miami yesterday. We plan to visit him and help in anyway we can. We are so sad that Captain Jim is not here for all the fun. Everyone here is hoping for a complete recovery. It is very special how the Island Packet Yacht fleet is “like family” and we share in everyone’s adventures and life’s challenges. Did you know they can swim?? Check the length of that tail. Do you think it will walk on a leash? My brother, Brian, loved walking his iguana on a leash. That lizard’s name was Iggy! Welcome to Marathon and Harbour Cay Club, our first destination, where we will be docked for one month. Our next post will be photos and sights of the grounds and the marina…for now….we need to settle into our new home….Thank you, CAPTAIN JIM!…..hope to see you soon….. Sailing Hawk Channel in 20 knots beam! Departing Boca Chita at 0700 hrs we crossed over the sand bar exit at low tide and found 7 feet of water most of the way. This is a deep water for the Florida Keys, and we were happy to be pressing on towards our destination south. We exited Biscayne Bay for sea via the Angelfish Creek, which is very beautiful but has a known 5 foot reef at the exit to sea. We have been instructed by our local Captain Jim that there is 5 feet at low tide, trust that and DO NOT LOOK at your depth sounder or at the water. Lucky for us it was a mid rising tide and we crossed the rocky reef with 7 feet of water, so no worries. Once at sea in Hawk Channel, we were able to set full sails, with reefed main, full 135% jib and staysail in a wonderful 18-20 knot beam wind! In the world of sailing, this is PARADISE – a dream day. Blue skies, puffy clouds, aquamarine colored water, and sailing at hull speed, it was as good as it gets. We sailed all day, racing to reach the entrance to Channel Five to get back into the Florida Bay side by sunset. Our navigation computer and route told us that we were right on schedule and that we would reach the anchorage by 1730 hrs, and that is exactly what happened. We motorsailed the last 40 minutes into Channel 5 and under the bridge, then turned south where we dropped anchor in Jewfish Hole. The sun was setting as we approached our two buddy boats, Long Gone and Catspaw so we were happy to get the the sails down and the anchor set. I rate today as a 9.5 on the sailing scale, it was a great day….Check out these photos and the color of the water! What a BEAUTIFUL tiny island, now owned by the National Parks Service. The island was originally developed by Mark Honeywell, owner of the heating control company in the late 1930s. After his wife’s death from a fall on the island, Mr. Honeywell abandoned the project and eventually it was purchased by our National Parks. We can see the highrises in Miami 15 miles to the north, yet we feel we like we are in the tropics! The island has the most beautiful lighthouse that stands guard over the entrance to the man made harbor. The harbor can side tie 20+ boats to the wall. There are several tent camping sites and public restrooms that flush with saltwater. There are no services on Boca Chita, no water and no electricity and no trash disposal, but there are beaches, trails and plenty of palm trees. This park is a must visit, and with the winds blowing 20+ knots today, we decided to stay one more day and enjoy the beauty. Tomorrow the winds will be 10-15, so we will continue our trek south to Marathon. I see why people stay here and simply take a break. It is well protected, it is beautiful, and the lighthouse changes in the various lighting angles from sunrise to sunset. Welcome to paradise, we are so happy to share the trip with everyone….the next stop will be on our way Marathon…. We utilized a brief weather window to go offshore from Fort Lauderdale to Miami, with a forecast of small craft advisories and worsening as the week progressed. We felt we could take nearly anything for the short 26 mile ocean leg to get into Biscayne Bay and be in more protected waters for the move on south. So, out the inlet we went with 15 knots blowing in and the tide still flowing in near high tide. Inlets can be very rough if you have the wind (in this case E at 15) blowing against an OUT flowing tide. Wind against current can be a dangerous situation, as the waves come up very steep and very close. Our exit to sea was manageable and once offshore, we added the full jib and staysail to the reefed main for a BEAUTIFUL beam reach to the Miami inlet. With departing Ft. Lauderdale at 1 hr before high tide, we arrived at the Miami inlet with the tide flowing OUT into the wind. Lucky for us, the winds were only 10-15 knots, plus Government Cut runs a bit south of east so the waves were manageable going into this inlet. It is so exciting to arrive Miami from sea, passing Hollywood, North Miami, and Miami Beach and then through the inlet leaving South Beach to starboard. Fisherman’s Passage goes south of Dodge Island, past the massive shipping cranes for the Port of Miami. This channel runs right up to the city, joining the ICW once again and going north or south depending on the destination. We are heading south for Marathon, so we entered Biscayne Bay with dolphins and sandy beaches and palm trees where we dropped anchor just south of the causeway bridge at Virginia Island. Our lead boat and buddy boat SP Cruiser Catspaw, Carey and Bobbi, had us over for a cocktail party. We enjoyed the company of another buddy boat, Long Gone, with Stuart and Chuck. Life is fantastic off a sandy beach in 75 degree Dec. 12th weather. Next Stop….Boca Chita, once a private island, now a park…. Massive cranes for offloading container ships. The Intra-Coastal Waterway from Lake Worth to Fort Lauderdale passes through 20 opening bridges in only 47 miles! We found it difficult to concentrate on navigating today, because we were distracted by the beautiful homes of North Palm Beach, Palm Beach and Fort Lauderdale. The waterway here has multitudes of man-made canals that lead into the mainland, perpendicular to the waterway. This design creates peninsulas that then create one end lot or several end lots where the most impressive homes are built. Another benefit of this design is that it creates perfect boat slips on the inside of the canal for docking 100′ yachts. The view of many of these homes was partially blocked by the yachts, which in some cases are larger than the homes. It was interesting to see the mix of older houses and the lots where old homes have been torn down in favor of newer models. Most of these mansions must be second homes, as we rarely saw anyone outside on this pleasant Sunday afternoon. We found it very interesting and entertaining looking at all these beautiful homes and it made this section of the ICW very enjoyable, even with all the bridges. Palm Beach and Fort Lauderdale are addresses of the rich and famous and it was fun to pass through the area. Multiple lots taking the entire end with canals on BOTH sides! Coming home from a Sunday afternoon cruise on the boat…an 85 footer at least! It was a great day touring the ICW past these beautiful homes. Take a look at this location on my Google Map and zoom into the area. Look at all the waterway cuts back into the mainland. This could NEVER be done today…. North Palm Beach condos and yachts line Lake Worth, FL. Departing Vero Beach, FL, is a challenging aspect of cruising because Vero has everything a boater needs….BUT…we did press on and move down to the Lake Worth anchorage. Anyone who has driven a car to Florida recalls passing the PGA Boulevard exit. Well, that same PGA exit turns into the PGA Bridge over the Intracoastal Waterway at the Lake Worth anchorage. This lake could hold at least 100 boats at anchor and provides a dinghy dock a few short blocks from a Publix grocery store. This lends itself to boaters who are waiting for a weather window to cross over to the Bahamas, only about 75 miles east of the inlet. Our plan this first trip south is to fully explore the Keys and the West Coast of Florida before heading over to the Bahamas in March and April. So, we dropped anchor in Lake Worth with a different perspective, we just needed a place to sleep and relax after the 64 mile run with SP Cruiser, Catspaw, Carey and Bobbi. This is the furthest south we have been on Island Spirit, so it was great to have experienced cruisers in the lead. Tomorrow, both boats will pick up anchor and move on to Fort Lauderdale where we will explore that beautiful city from the anchorage at Lake Sylvia. I must say, this section of the ICW was very interesting and colorful with beautiful homes and large yachts. I am glad we did not miss this by going outside as we had planned. Here are some photos of this section….with entertaining captions of what locals might say. 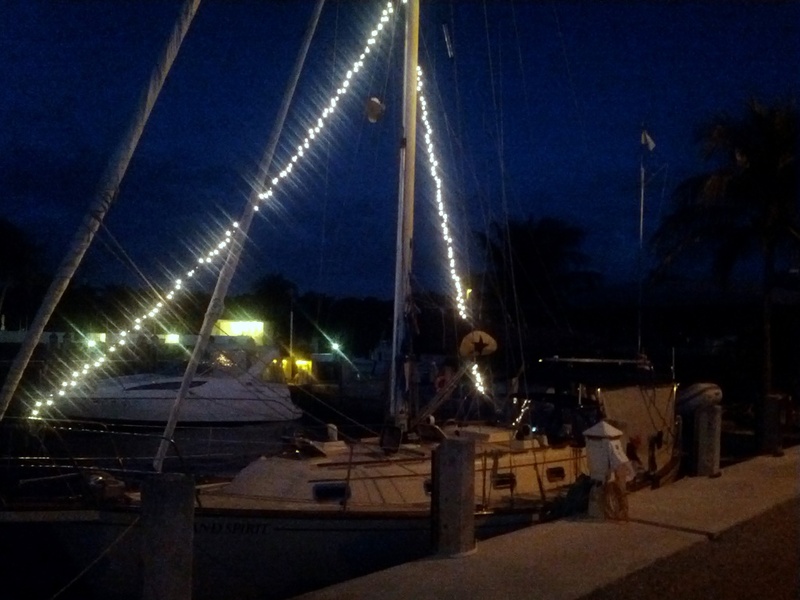 Look, we keep our small 80 footer docked behind our winter home…very nice! Come on, where is YOUR Hinckley Picnic jet boat? Ours is here, behind the home….$500K….check! Yes, but we have our 58 footer lifted and dry sailed behind our home….Check that! WOW…that was really an interesting section of the waterway, and I am glad to see our economy doing so well that people do not have to sell these homes. There were very few FOR SALE signs like in other areas up north. Looks like we are reaching the real 1% soon. Just wait until we see what’s next….Fort Lauderdale…. Water, Fuel, Pumpout – the big three! Mail call – our first batch of forwarded mail since departure, thanks to our terrific house sitter. Oh, the excitement of being in port! Life takes on a new feel and the options for adventure are vast. Vero Beach Florida is one of those towns we both agree we could move to. This and Wrightsville Beach, NC are the two towns so far that make us feel that way. We don’t ever plan on moving out of our beautiful solar home, but it is fun to look and imagine. Here are a few photos of Vero 2. Date Palm Drive, our favorite street right off the marina. Our Coach, Almon, who is so kind and helpful. He teaches us how to play the game. Yes, life in Vero Beach is wonderful! There are so many services and you don’t need a car due to the free bus. The beach is fantastic, the restaurants delicious, the marina is a dream, and the boaters flock to this location. It is easy to stay here for weeks, and it is very difficult to make yourself press on, but that’s what we did AND we did it in 15-20 knots NE wind with rain….. WHAT? ARE WE NUTS?….yes we are, but the Florida Keys are calling us and that is our next big destination.